Basketsgalore Ireland has introduced the fabulous selection pack of Fivemiletown Creamery Cheeses from County Tyrone, which were hitherto only available at Christmas Time. 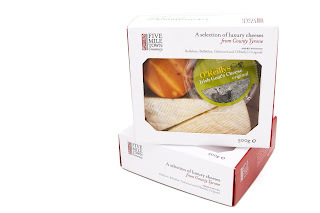 Within every pack there is 150g of each type of Fivemiletown's range of cheese Ballyblue, Ballybrie and a smoked Oakwood. Complimenting the selection is an O'Reilly's 90g portion of Goats Cheese. What we particularly like about this packaging is that it is of gift standard quality and you can see that a lot of time and effort has gone into making it a high quality professional design. We've asked Fivemiletown Creamery to send them to us throughout the year, so that our customers in Ireland can take advantage of what we think is a truly wonderful selection of cheeses at an unbelievable price. The Fivemiletown Creamery pack will also be available to buy on an individual basis from our create your own gift basket website, which is coming soon. GiftBaskets.ie will offer the best products at the lowest prices in Ireland. Once again let us know what you think of our cheesey little gift ideas when you receive a cheese hamper from your friends and family.